Unravelling the Fresco: An interactive multi-media painting of life in the lands and forests of Acadia. In order to enhance the image of Madawaskan socio-cultural heritage, the Web site Unravelling the fresco has been developed and placed online in Canada’s two official languages. It documents numerous elements linked to our heritage. It can be used for personal and educational ends or for research purposes. A unique collection of 2000 historical photographs (1936-2001) taken by the professional photographers of Studio Laporte in Edmundston. 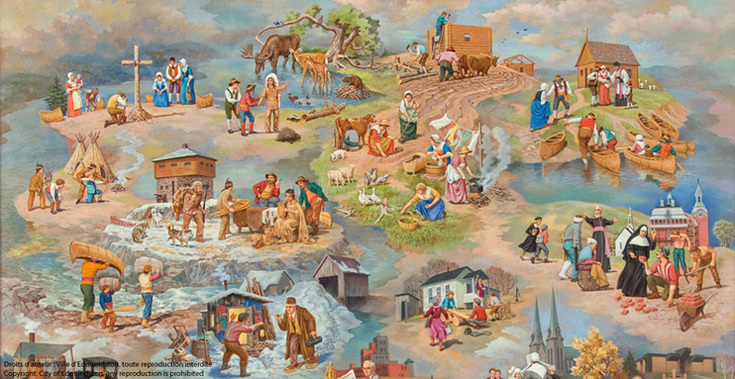 An interactive historical fresco including learning objects based on the 24 scenes contained in a mural created by well-known artist Claude Picard for the 1985 Madawaska Bicentennial, and on explanatory texts published in a special edition of the local historical periodical, Revue de la Société historique du Madawaska entitled La vie au Madawaska 1785-1985: fresque historique de Claude Picard. Artistic and historical vignettes expressing a renewed and dynamic vision of certain aspects of the history of the region of lands and forests, which were created by students from School District 3 in northwestern New Brunswick. A detailed inventory of at least 10,000 photographs or other iconographic documents from the Studio Laporte Collection, now owned by the Société historique du Madawaska (the Madawaska Historical Society). 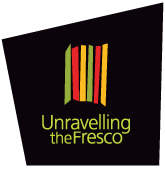 The Web site unravellingthefresco.umce.ca aims to contribute to the diversification of Canadian national heritage online. It illustrates certain important aspects of the culture of the inhabitants of Madawaska by describing the various sociological and cultural aspects of life in a Francophone minority region, situated in the less well-known lands and forests part of Acadia (northwestern New Brunswick). Also visit: www.toucherdubois.ca (Knock on Wood: The forest at the heart of the madawaskayan social and cultural heritage in Acadie).